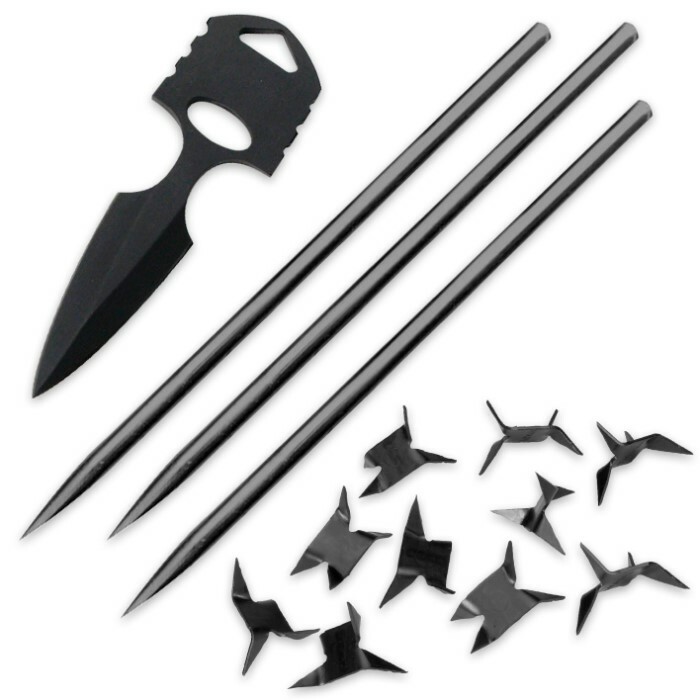 Black Legion Ninja "Bag of Tricks" - Knife, Push Dagger, Spikes, Caltrops in Nylon Sheath | BUDK.com - Knives & Swords At The Lowest Prices! When you live the life of a ninja, assassin or black ops agent, you never know what pitfalls you may encounter on any given day. Need to set a trap for a hidden or trailing enemy? Is attacking your opponent from afar your best move? Maybe you're embroiled in a face-to-face, close quarters brawl with a rival. No matter the peril, Black Legion's Ninja Warrior Bag of Tricks will always keep you one step ahead of your foes. It features a diverse arsenal of potent weaponry suited to practically any treacherous or hostile situation. The fierce 11” Midnight Black Fixed Blade Knife is the set's crown jewel, boasting a razor sharp 6" tanto blade - legendary for its ability to pierce and stab its way through virtually any material. Forged with heat treated stainless steel, this extraordinary full tang beast of a tanto blade can withstand years - even decades - of vigorous use, and it's always a pleasure to wield, thanks to its ribbed, no-slip rubberized grip. The Bag of Tricks includes another hand-to-hand combat favorite - a 3 3/8" push dagger, discreetly tucked away inside the knife's handle pommel. With a stinging 1 5/8" double edged spear point blade, this little devil packs a big punch! Three 4" throwing spikes make quick work of distant adversaries, and ten 7/8" caltrops lay a dangerous trap sure to slow down any would-be attacker. Just throw these barbed menaces and they always land in an injurious position - prongs up! 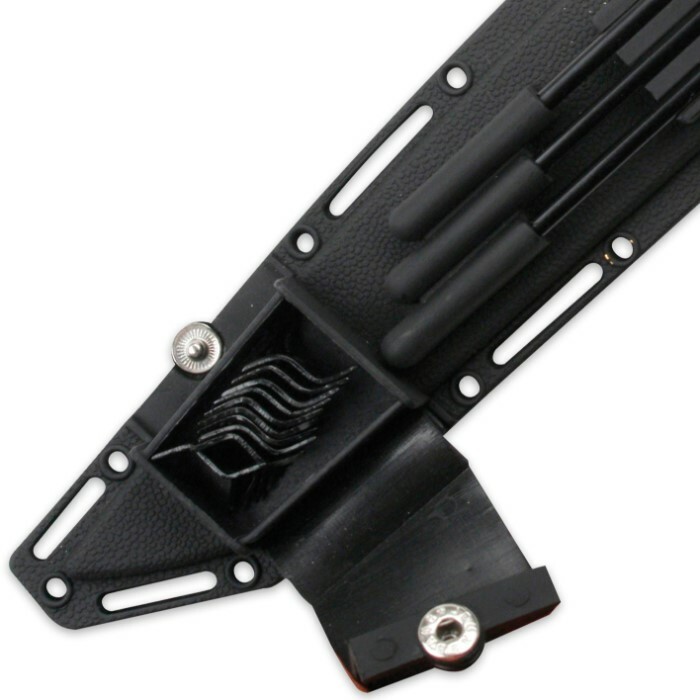 All of these robust arms fit conveniently in a single tough black nylon belt sheath. Just grab it and go! The Ninja Warrior Bag of Tricks from Black Legion is practically all you'll ever need, come what may. Best of all, this potent array of weaponry is surprisingly affordable! Order today! Wise ninjas don’t procrastinate when it comes to preparing for danger. I love it. Actually like it said. Knife is great and I love the accessories. Recommend for anyone that is serious about self defense. Love it. This blade was extremely sharp when I got it but the handle is extremely cheap. The caltrops are real deal and the spikes can be used for stabbing not throwing unless you're a real ninja. I really like the knife but the handle was too slippery and fragile. So I got the blade because it seemed like a fun little setup, and so far I enjoy all of it, but the spikes are a huge pain to pull out, and the push dagger is far too small to be used safely for nearly anyone I know, as they would hurt themselves on the blade. The caltrops work as advertised, but seem mildly flimsy. Altogether I am happy with the product, just mildly let down by a few things. TLDR: Would buy again, just wish it was higher quality. This is surprising quality for the price. I had a bit of difficulty drawing the bo shuriken on the first try but it got easier, the push knife is excellent, and the blade itself is well made and balanced. I am highly satisfied. If you are debating the purchase-do it, it is worth the price. Brought this blade a while back. I still use it quite often for an array of applications. Blade is dang strong stays sharp. But if need be, sharpens fast, ez, great edge retention. Hidden push got loosened after a few draws(i put a epoxy coating along the center on both sides, problem solved still fully functional). Great buy. The Sheath is pretty nice because you can quickly release the knife and it has the strap holes on the sides so you can mount it pretty much any where on your body. The push knife in the handle is awesome and so is the knife itself. The only thing I don't really like is that the darts are so hard to pull out, you literally have to pull the knife out then you can draw the darts. Other then that everything is pretty great. this is an awesome knife setup, the caltrops are 1/2 the size as my others they are perfect for this multi functional weapon. i would have went with velcro closier on the caltrops other then the snap but all in all its perfect. For 15 dollars you can't beat this interesting combination. 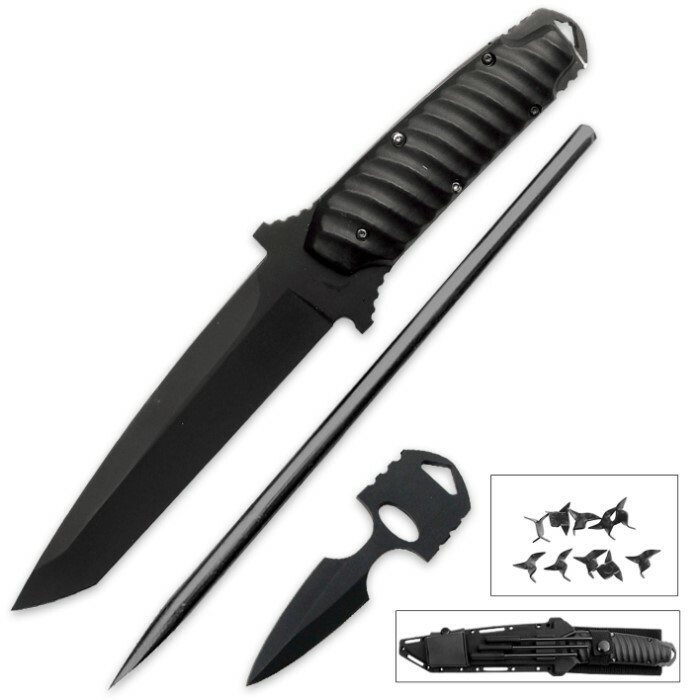 The Tanto isn't made of the best qaulity metal but for the price its good. Solid enough. The push dagger comes out of the handle of the tanto and has a decent point. Although it is a bit dull on the sides. The spikes are end in a sharp point, and the caltrops, while small, are sharp as well. All in all a fun piece for anyone at this price. I love this set, it may not be the best steel but it is awesome, comes with so many gadgets and has a great price!